In addition to its usual duties – like making downtown Kent a pleasant destination as well as holding great events – the Kent Downtown Partnership (KDP) is working to restore the Morrill Bank building on the corner of 1st and Gowe, which currently houses the Alleluia Catholic Store. 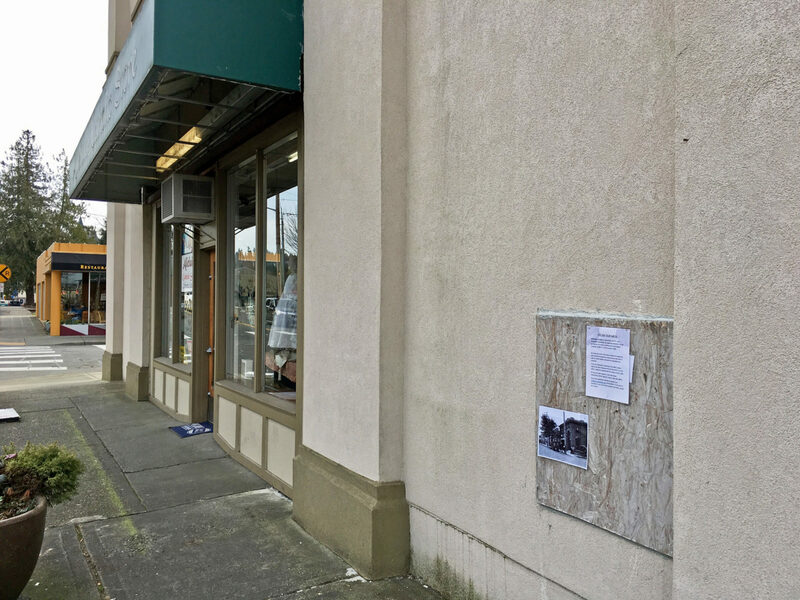 Greg Haffner, of Curran Law Firm, was able to obtain a $1500 grant from 4Culture, a founder and supporter of cultural work across King County, to help fund the restoration investigation. The building is owned by the non-profit Multi-Service Center. 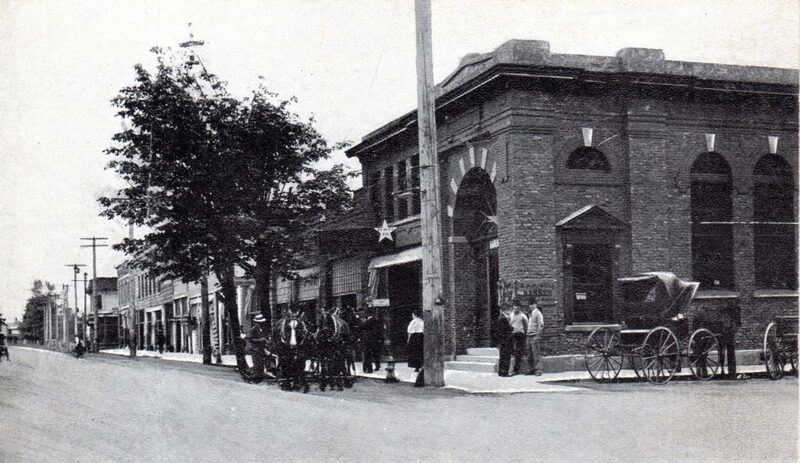 Morrill Bank building, circa 1910. 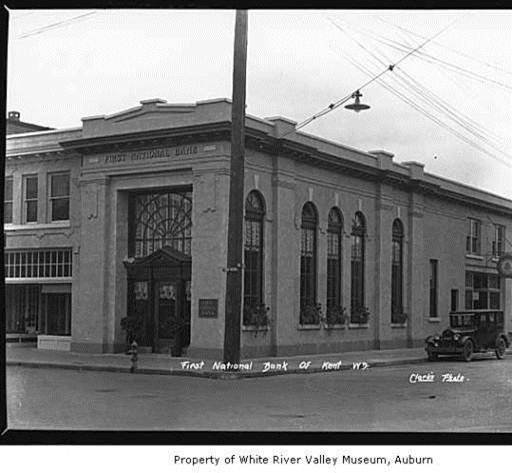 Morrill Bank Building, circa 1924. Ironically, when this 2017 “street view” image was taken, a worker can be seen on the right side of the building working on the hole in the stucco façade. Last year, the community trusted the KDP and Mr. Haffner by donating $15,000 to the KDP to investigate restoring this historic building. The Morrill Bank Building was built in 1910 of distinctive clinker brick with grand two story arched windows. Although the stone arched entrance on 1st Avenue was replaced with a large square window with radiating wood framing, the other features of the original building appear to be intact. Unfortunately, they are also covered with a stucco-like exterior. Using the funds provided by the community, the KDP hired professionals in the field of historic restoration to investigate what lies beneath the current exterior. 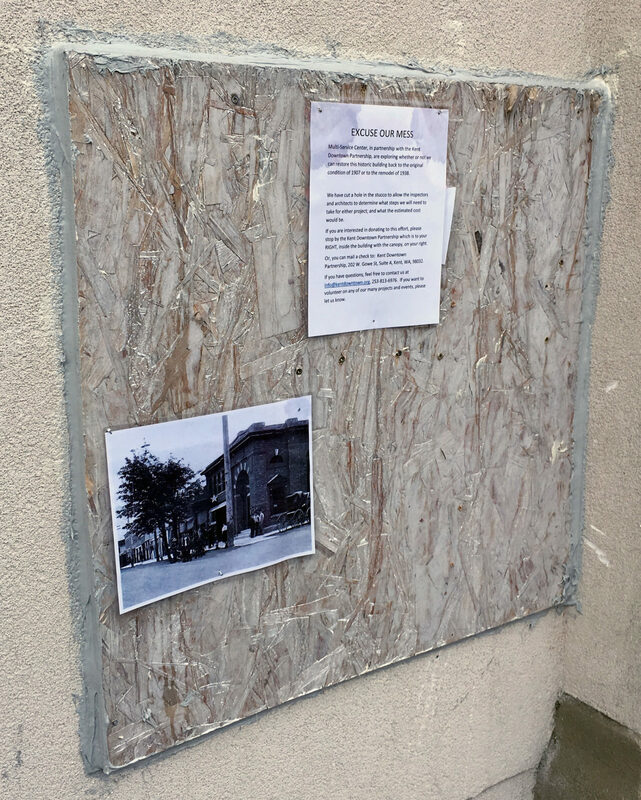 After inspecting the building from inside and cutting an opening in the stucco, they determined that all of the window openings appear to be in place. However, the stucco is installed over another layer of product called marblecrete which is applied directly to the brick. A supervising architect has provided a rendering of the potential building restoration, and the KDP is now seeking estimates for that work from restoration contractors. Once they learn the cost of the restoration, they will explore how to raise funds to restore this beautiful example of Kent’s early history. Stay tuned for updates. If you have any interest in helping with this project,whether by finding funding, grant writing, or contribution in some other way, please contact either Greg Haffner at [email protected] or Barb Smith at KDP at [email protected]. 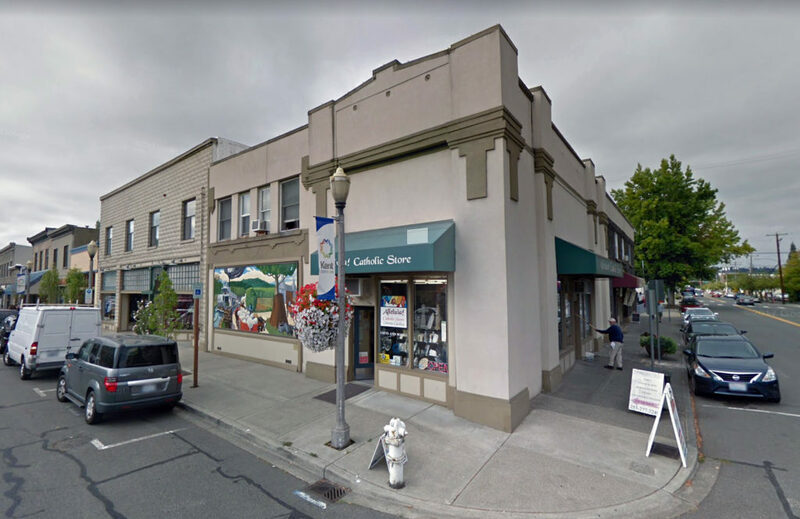 Not so well-known is the fact the KDP is a member of the Main Street Program, overseen in Washington State by the Washington Trust for Historic Preservation. Main streets across America are not only centers of commerce and culture, they are also located in the most historic districts of their communities. One of the goals of Main Street members is the preservation of those historic districts and the buildings within them. 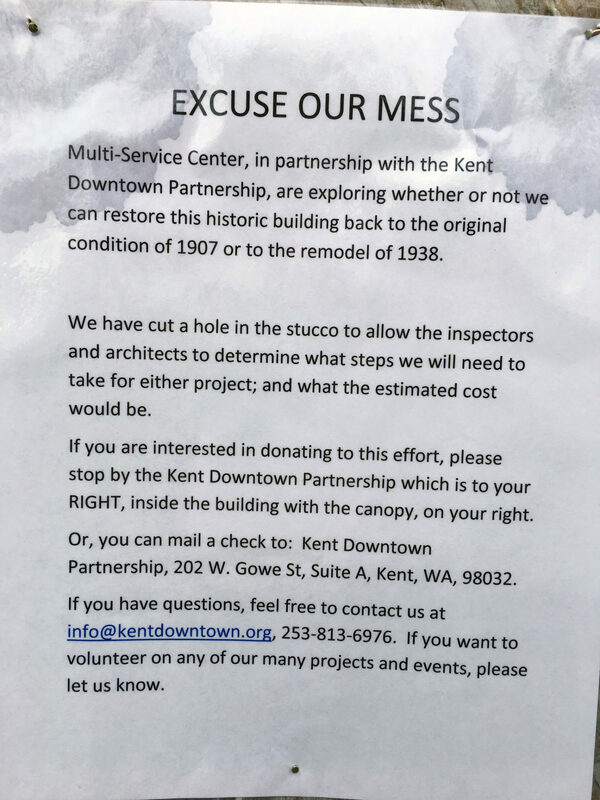 For more info, please visit https://www.downtownkentwa.com/.